By wearing an academic hood in your graduation commencement, you are revealing to others the academic accomplishment you have in a particular academic field of discipline so looking your best in the finest Academic Regalia is of upmost importance. In many academic ceremonies, the faculty and the students are generally seen wearing distinguished Doctorate PhD Hoods. 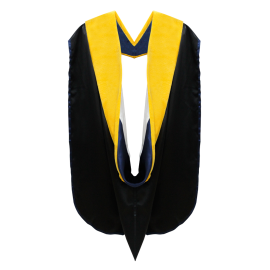 Although Bachelor’s, Master’s, and Doctor’s graduates wear these hoods, their cowls are slightly different. In terms of colors and shapes, the faculty’s academic hoods are different to that of the students’. The hoods differ to each other in regards to the academic degrees that they stand for. A doctorate’s hood is different to that of the hood with a master’s or bachelor’s degree. The Doctorate Degree PhD Hoods pair nicely with our Deluxe Doctorate Gowns, Tams, and Beefeaters! We recommend you take a look at our Doctorate Gown and Hood Package if you need more than just the academic hood. Order your Doctorate Academic Regalia now and have them delivered right to your door.